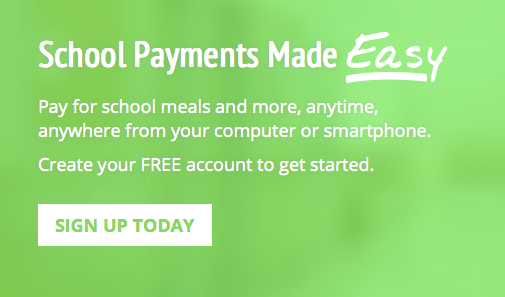 Parents can enter payments online as well as track your child's specific cafeteria purchases each day at My School Bucks. Another feature we LOVE, is that this system offers an option where parents are sent a text notification when their child's account balance reaches a low level. That amount is set by the parent. Registration and parent use is EASY. Click here, or the picture below to sign up today. How do we enroll our students in My School Bucks Online Payment Systems? When you go to www.myschoolbucks.com, you will see the opportunity to Sign Up Today! On the first page, you will be given the opportunity to choose both “Tennessee” from a drop-down list and then “Germantown Municipal School District” from a second drop-down list. IMPORTANT: You will be given the opportunity to receive text messages pertaining to your child’s account. Once you have completed this page (and verified your text alerts with the code sent to you if you chose that feature) you will have the opportunity to add a child (one at a time). You will need your child’s first and last name. You will need your student’s lunch ID number. These are in the process of being sent home as of Friday, August 12, 2016. Please be advised that these lunch ID numbers are NEW this year. It should be a four digit code. *If you or your child need help locating this number, your homeroom teacher should be able to help. Once the PowerSchool Parent Portal opens, (August 15, 2016) parents will also be able to check that number there. Tips on helping children memorize a new lunch number. The student ID number is their 5 digit Skyward ID, including leading zeros. Parents are encouraged to practice the number at home with younger children. This will help teachers and our cafeteria staff get the lunch lines moving much more quickly. What happened to remaining balances from the 2016-17 school year? What other conveniences are offered through My School Bucks? My School Bucks offers an app that can be downloaded on the App Store or on Google Play so you can see your student’s balance or his/her latest cafeteria’s latest purchases. Free and Reduced-Price Meals Please click here to read more about eligibility and how the program works in the State of Tennessee. If you are looking for an application, please contact your local school administration or homeroom teacher.